the Food Network has descended upon Portland again. Yep, this is show biz, people. TV people waste a lot of tape. TV people don't get to see their families much. TV people don't like it when you really eat. TV is not real. And my father is not gay. 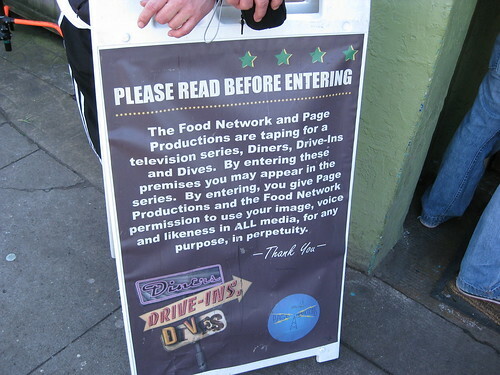 Image of Food Network release placard at Pine State by Ben Waterhouse. Image of Fieri and Camaro courtesy of writemeg.wordpress.com. An Otto's lover with a camera has promised to send me shots of the Food Network crew at the sausage kitchen. I'll add 'em one I've got them.